As I mentioned in my post entitled "An Admission", I have been taking an on-line course in "Photoshop Artistry" in order to learn some new techniques and experiment with opening up some new creative avenues to explore. This involves some weekly assignments and I mentioned that I would post some that turn out interesting. The assignment that led to this image was to combine a portrait and a nature image along with two textures, an edge effect, and the use of selective black and white along with the ability to use any other Photoshop tools. And the composition was to be in square format. The 'base' image is actually a photo of a portion of an impressionist painting that I took last summer and it is combined with a scenic that I took in the Smoky Mountains that was rotated vertically. Rather than approach this as a composite, I used the scenic photo as a 'blend' to affect the texture and tonality of the original and the result of that blend, as well as the added textures, edges, etc is below. One of the things that I have been fascinated by is how images can be blended into each other to generate lighting, tone and texture effects. 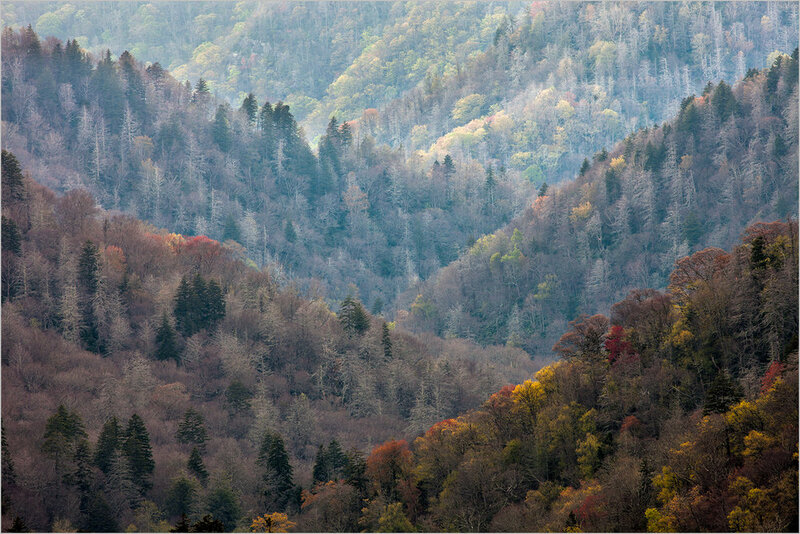 For example, that Smoky Mountain Image that is blended in is below....before being rotated vertically and made into a square. One would never identify it as part of the image, but it is in there as a 'texture and color' builder.